Thinking whimsically makes serious science accessible. That's a message that should be taken to heart by all readers who want to learn about evolution. Do Elephants Have Knees? invites readers into serious appreciation of Darwinian histories by deploying the playful thinking found in children's books. Charles R. Ault Jr. weds children's literature to recent research in paleontology and evolutionary biology. Inquiring into the origin of origins stories, Ault presents three portraits of Charles Darwin--curious child, twentysomething adventurer, and elderly worm scientist. Essays focusing on the origins of tetrapods, elephants, whales, and birds explain fundamental Darwinian concepts (natural selection, for example) with examples of fossil history and comparative anatomy.The imagery of the children's story offers a way to remember and recreate scientific discoveries. 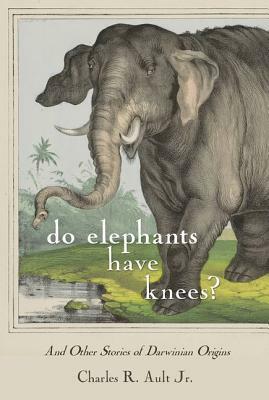 By juxtaposing Darwin's science with tales for children, Do Elephants Have Knees? underscores the importance of whimsical storytelling to the accomplishment of serious thinking. Charles Darwin mused about duck beaks and swimming bears as he imagined a pathway for the origin of baleen. A "bearduck" chimera may be a stretch, but the science linking not just cows but also whales to moose through shared ancestry has great merit. Teaching about shared ancestry may begin with attention to Bernard Wiseman's Morris the Moose. Morris believes that cows and deer are fine examples of moose because they all have four legs and things on their heads. No whale antlers are known, but fossils of four-legged whales are. By calling attention to surprising and serendipitous echoes between children's stories and challenging science, Ault demonstrates how playful thinking opens the doors to an understanding of evolutionary thought.